You will notice immediately if you have an awareness of the STEM acronym (Science, Technology, Engineering and Maths) that, like others, I am inserting the usual, additional letter in there (A for Arts – as recognised in the US, for example by this campaigning site), together with a less usual, silent second M (for Media) at the end. The reason for the silence is that it is almost totally absent from the formal school curriculum in this country. The reason for its presence in STEAM(M) is that it is always present anyway, regardless of the particular predilections of the authors of the curriculum or their masters, the politicians who decide what it is included or excluded from study here. In fact, we swim in media daily. The moving image is the dominant form of communication. Text-based media are also consumed on a vast scale, if more on-screen than on paper. Social media circulates in profiles, on blogs and at the speed of 140 characters per second. Children know this, adults know this, teachers, parents and carers too – their attention to safety as the key issue of the day is symptomatic of this and shouted loudly every time the area is debated. But the M is silent and absent in our formal, curriculum organisation because… well, why? Like many, I was enthusiastic about the introduction of the Computing subject area, a new (old) way to think about computers in our schools. Of course, the indecent haste and the ditching of some of the good things present in the old ICT curriculum, was unhelpful and it may take many years to train enough people to teach this area. Nevertheless, the whole movement represented a successful initiative which built momentum through high-profile activity (photo opportunities for politicians with huge IT corporations), economic imperatives (the only way to future employment is to know how to code) and an appeal to traditionalists who don’t really get it (you tell them that computing is the new Latin). A great groundswell of good stuff is happening all round this subject area with coding clubs, learning in maker spaces and some very helpful work for teachers who may be struggling with it in school here and there. I would argue that the next step is to connect this to other curriculum areas, particularly in the arts and media. Because at the same time as there has been a triumph for the STEM lobby, and many positive gains, there have been huge losses to the arts in education in the curriculum (as pointed out by many – here is one example of the kind of commentary). In recent years, they have been downgraded in formal schooling in spite of the obvious connections with the economic arguments (in-game authoring and special effects, for example, there are artists, storytellers, composers, designers and filmmakers working alongside programmers; they depend on one another). So, putting the A back into the acronym and building a new campaign have never been more important. There is an interest in enriching the computing curriculum by giving it some wider cultural and pedagogical context. But beyond all this is the well-established need for arts education and its connection with positive outcomes for collaboration, critical engagement, cultural understanding, problem solving and even, possibly, enjoyment. In terms of the curriculum, coding and creativity can go hand in hand… This connection between Digital Arts and Education is something at the heart of the DARE collaborative, of which I am founder member, and you can read about some of the projects which are attempting to do this here. Most recently, my colleagues have been successful in gaining funding with the British Library to make a computer game from Beowulf. What better evidence of the connection of new and old, arts and science, reified canonical work and new cultural form could there be? As noted above, the silent M of Media in STEAM(M) is all around us. The ways in which art, music, film, animation, sciences and social sciences circulate in wider culture are all in media, sometimes social media, and sometimes broadcast media. And there are ways of becoming productive with both which do not necessarily require permission from curriculum documents. And I am not talking about learning media through other subjects, which always reduces media education to a technical support or simple AVA role. I am talking about systematic ways of connecting the arts and STEM by means of Media Education which develops the skills of making and the language of the moving image, its grammar and syntax (for those worried that this is really just play and anarchy, there can even be rigour in learning this too, just like a New Latin). For some time it seemed possible that “Media Literacy” might be a way of suggesting rigour and a conjunction of the M word with the L word (a word with undoubted resonance) looked like a good way to represent the inherent subject discipline. It is just possible that the various other distributed versions of literacy may be able to carry some of this weight, and some of this rigour into classroom more easily. Certainly “digital literacy”, however ill-defined and lacking in shared understanding of meaning, does seem to be one way to enable productive discussion of engagements with media and essential lessons in safety. Formally, later in the school years, there are still courses in Media Studies (at the time of writing) and Film education attracts funding – at least for after school provision through the likes of Into Film. Organisations like the Film Space and Learn About Film provide great ideas and resources and BFI Education reaches many children and schools and connects the arts and sometimes the sciences together. Film, as a recognised art form, does not suffer from the same positioning as “media” as the absent other which can’t be named because a commentator, possibly someone who would not actually be able to handle the rigour involved in its study, will ridicule it. And yet, it too requires more, a higher profile, a connection to the arts curriculum, an unapologetic recognition in schools that it is of equal importance to the computing curriculum. The STEM lobby made their argument very well and really I am arguing that the new age of STEAM(M) is upon us and we would do well to think about ways to enable children and teachers to go beyond STEM, to embrace the arts and learn about and with media. There must be ways to win this argument and to encourage the use of animation, music, arts, photography, film and, yes, programming tools in an inclusive definition of literacy appropriate to the century. It is apparent in many countries around the world that this is necessary and desirable and it is strange to live somewhere where reference to the moving image has been surgically removed from the curriculum for primary schools for the first time in more than twenty-five years. For teachers who are worried about deviating from the prescribed curriculum, let’s see if the door is slightly ajar anyway with the reference to “digital texts” in the computing curriculum and take it from there. In the presentation, I wanted to use the word “coding” to encompass many activities. So coding is – in this presentation as elsewhere in common usage in educational circles – hazily (and lazily) conflated from terms like coding, programming, computational thinking and app building. This very possibly drives real coders and computer scientists mad though that was not the intention. It was really only to use it, like many others, as a shorthand way of describing the activities arising from the new orders for computing in school. The reason for doing this was to use the presentation as an starter for a conversation about changes to the curriculum which will see “computing” replacing “ICT” in schools in England from September 2014. Generally, I think this is a positive move, though it has been brought about much too quickly and with too little regard for the subject it has replaced, namely, ICT. From personal experience, I can see that sometimes this was not well conceived as a subject or well taught. But it was not all bad and neither was it always simply about teaching the skills of Microsoft Office, though this was how it was portrayed by the various lobbyists. A lot of very good work has been forgotten, sidelined and even ridiculed. We now at least have a task force appointed to see of some of what we knew then and know now can be applied to what happens next. Perhaps the best thing to come out of the move is the opportunity to have conversations about what coding is, how it should be taught and what it means in the wider world. The pace is rapid and the talking takes place against a background of ongoing curriculum reform but there is the possibility of positive change if we frame coding as part of wider, lived experience. And so…instead of discussing the National Curriculum itself in detail, I wanted to talk about the other huge issue, that of how coding might actually work in schools and communities. I wanted to present it as part of media culture, not to set it apart in a computer science bubble. More than that, I wanted to present a positive view on how it could work, how it could be enacted and how it could find a purposeful place in schools, in the home and in the “third space” between the two. In the real spaces of the after school club and summer school, partly in response to the problem of there being nowhere near enough qualified teachers ot take on the computing curriculum, there are after school clubs springing up which are being run by expert users and educators who see the value of giving children and young people a broad experience of digital making and doing. NESTA, for example, is the funding body behind the “Make things do Stuff” site which brings together media forms and coding in the same space. Other organisations foster creative action in programming and app building in a variety of settings. It’s not possible to list them all but organisations and SMEs doing exciting work in this are in an enabling way include Apps for Good, Codasign, CodeClub, Young Rewired State – many of whom were mentioned during her presentation at Stirling at Codeacts by Amy Solder. Some of the apporoaches of these organisations are mentioned in “Mapping Digital Makers”, Julian Sefton-Green’s recent review for the Nominet Trust and also have synergies with digital making in the US and in particular the work of Kylie Peppler who has produced a report for the Wallace Foundation on interest driven creative digital making. I was speaking about this “third space” in two ways. Firstly, as the literal third space of the after-school club, an example being the inspirational Hackey Pirates or CEN8 in Deptford. 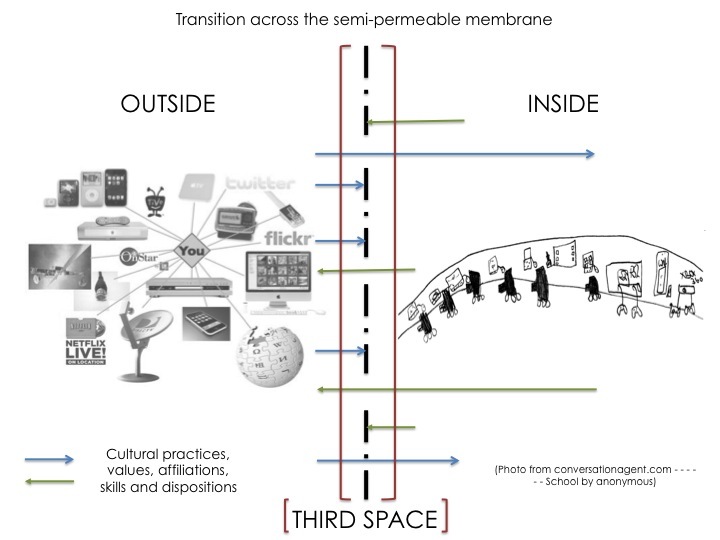 Secondly, I was seeking to define it as a metaphorical third space, located between the cultures of home and school, following the work of many others including Jackie Marsh specifically in relation to media cultures. In the slide above, children and young people are daily in transition across this space, recognising that some of what they bring with them as part of their material lived culture will not be welcome or usable inside the school as a resource. They leave many of their important affiliations and markers of identity at the school gate and, in some settings (not all, by any means!) they find only small reference to the culture they are living in every day and the practices they undertake in that wider culture. In an environment in which outside culture was valued more, teachers would be able to make use of these resources to locate and build on the skills and dispositions which children and young people exhibit outside school. Good teachers do this already in spite of the performative constraints on them from a punitive inspection regime and a political system in which neither of the large parties will trust them to be professional. In sharing and making things in wider digital culture, children and young people exhibit skills of problem solving, critical literacy and more. It’s not all one way, however, because, again in a positive version of this picture, many things of value can pass in the other direction from school to home through good teaching and learning practices, not least among them a sense of criticality and judgement. In the diagram, as I’ve written about elsewhere, things of value pass through in either direction through the semi-permeable membrane between the two spaces. And the space in which they do this is the “third space”. What has the “third space” got to do with coding? Can we connect the teaching and learning of coding to that of reading and writing? Good pedagogy in the teaching and learning of reading and writing acknowledges the situated nature of language. Reading and writing well depends on many essential, technical decoding/encoding skills but the way in which this has been the sole focus of so much teaching because of a poorly managed and polarised debate harms everyone. The synthetic phonics “method”, for example, which has become so widespread in application has reached its nadir as an absolute in a “phonics check” which appears to be destroying the confidence and ability of beginner able readers. Synthetic phonics as a sole “method” confines a literacy teaching scheme to the narrowest of technical definitions and certainly ignores many of the features of language acquisition such as reading for meaning, context, exchange within a culture, the practices of language which we have known about for years. This goes back in pedagogy to the teaching of literacy as socially situated practice, exemplified by educators such as Harold Rosen and his son, the writer and broadcaster, Michael Rosen. In the developmental view of writing, children come to know that the marks which they make stand for them when they are not there. They learn this not simply because of direct technical instruction but also because they see the use and the impact of writing on the lives of the those around them: in shopping lists, text messages, web pages, letters, forms, notes from school and so on. Marian Whitehead, and many others, have written about this in the context of good early years teaching and learning. When children know that writing has a purpose or a reason for existing they will use it freely and in an agentive way. There is a breakthrough moment when children see this for themselves. Whitehead quotes an example of a child leaving a note for a teacher to explain that he is in the playground. The arguments for coding have thus far been made by the computer science lobby but there is much to be gained from a broader alliance with the digital and media arts. With our special effects and games industry dependent on artists and designers as much as on coders we should have media production in school as an entitlement and re-establish the creative subjects as essentials alongside them. Could this not also be connected up with current initiatives in the teaching of film in schools, most recently Into Film, Film Nattion UK et al? It certainly is no time to downgrade any school qualifications in media studies, digital or creative arts. 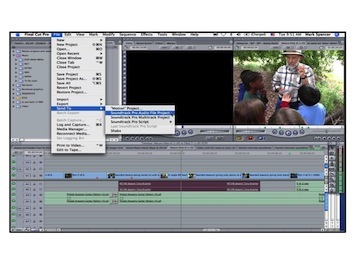 A good game or a good film production depends on the cultural layer as much as the computer layer (as in the definitions provided by Lev Manovich). 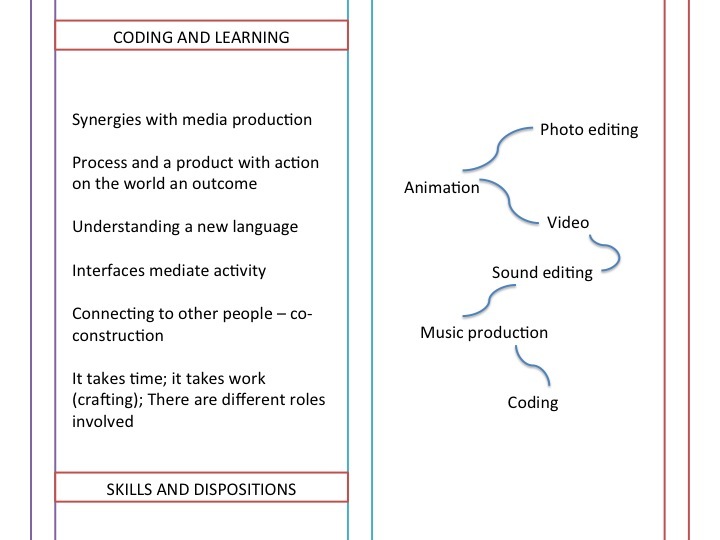 In terms of the skills needed to be productive in digital culture there are some aspects which are common to both coding and, for example, editing. A moving image production, live action or animation, requires an understanding of how the software operates and conflates real craft skills into a space with its timelines, tools for cutting and pasting, adding sound, titling and effects through its tools and their onscreen affordances and so on (see the work of Julian Sefton-Green for more on this). 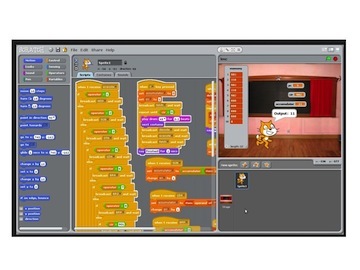 Scratch, a popular environment for learning about coding, works bpartly by providing programming affordances through onscreen images of procedures nesting inside one another. Both are sets of visual metaphors and both conceal the work of the code behind enabling sets of tools; both also allow for creative action to be shaped by careful use of such onscreen tools. Furthermore, both produce results in the world that can be viewed and/or used and/or consumed by others. 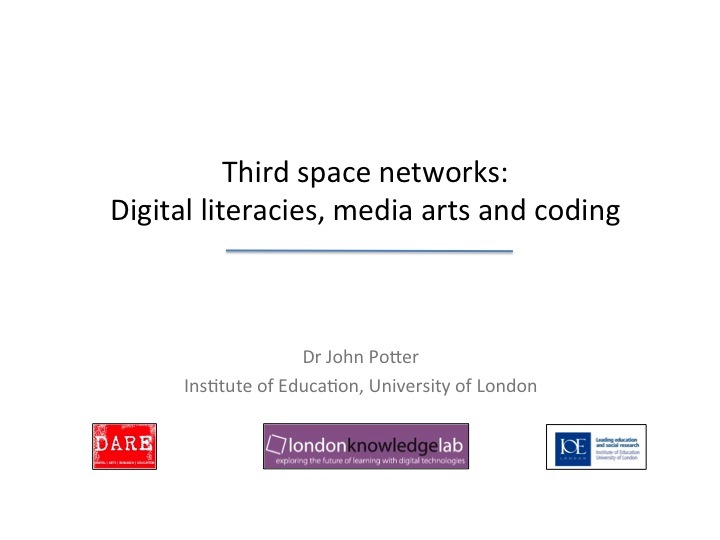 I’ve been in the privileged position in recent research projects to observe children and young people working with both film editing and coding in the “third space” of after school clubs. There are similarities in the ways in which both tasks were approached and the lessons learned in each reflected the investment in the craft skills of making to produce high levels of engagement. One element in common is the awareness of the effort required to make it work; like programming, media production is far from being an easy option (as it is so often described in the cultural stereotype used to ridicule “media studies” by its high-culture inflected, ideological opponents). In the years to come, I think it will be important that coding is connected to wider media culture and to media production and for children to experience the kind of teaching and learning in whatever space which values the skills and dispositions towards making and creating which they bring to the tasks at hand. I have written elsewhere about how the experience of media production and exhbition is finding wider currency as a metpahorical process of “Curation” of experience. The nature of coding as social and elaborated through collaboration means that there are possibilities for chidlren to curate their procedures and programmed creations. Just as they can – and do , in some cases, use portfolio or notemaking software such as Evernote to record learning and associated processes for themselves can they not also create and curate a portfolio of their growing development as a coder? Scratch, for example, was successful at least partly because of the social media element built into the site, a kind of YouTube for procedures with comment spaces and a further connectiuon to wider experiences. The message I wanted to give is that, for it to succeed in the longer term, coding should not become a dry, procedural, technical exercise in schools, divorced from popular culture. Teaching methods at home, at school and in the “third space” which encourage real-world problem-solving approaches, collaboration and a connection to other kinds of media production will succeed.